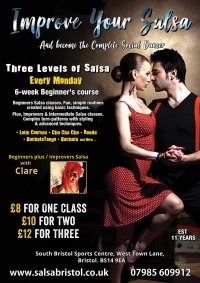 We run multiple levels of Latin dance classes which cater for the complete beginner through to the intermediate dancer. You can be any shape or size, aged 18 plus, don't need a partner, or have had any previous dance experience! New Courses Start 2nd May 2019! How about doing something that is designed to be fun, that will increase your fitness, help you lose weight whilst meeting new people? We will teach you to dance the hot Latin dance that is Salsa! Each week Alex Fright & Hannah Levick run our Improver and Intermediate level classes. There is a focus on teaching leaders and followers technique, styling, and having fun. There is no need to have attended our lower level classes in order join this classes and you can come along any week, alone or with a partner. Come and join our friendly classes and improve your Bachata. In this 8-week course, Alex Fright and Hannah Levick will guide you each week, firstly focusing on the basic footwork and will quickly move on to turn patterns and introducing other styles such as Dominican footwork and sensual styling. 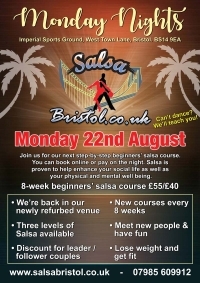 Some previous experience of Bachata and or Salsa is advisable to join this course. Pay per course, or per week. Two levels of Salsa follow at just an extra £2 each. Back by popular demand is Rueda. Rueda always proves to be popular and students always have a lot of fun learning this "team" dance. Alex will be teaching to all levels, however, we ask that you have at least 6 months of Salsa experience. Looking for a Christmas, Birthday, Wedding present - a present that's a just little different? 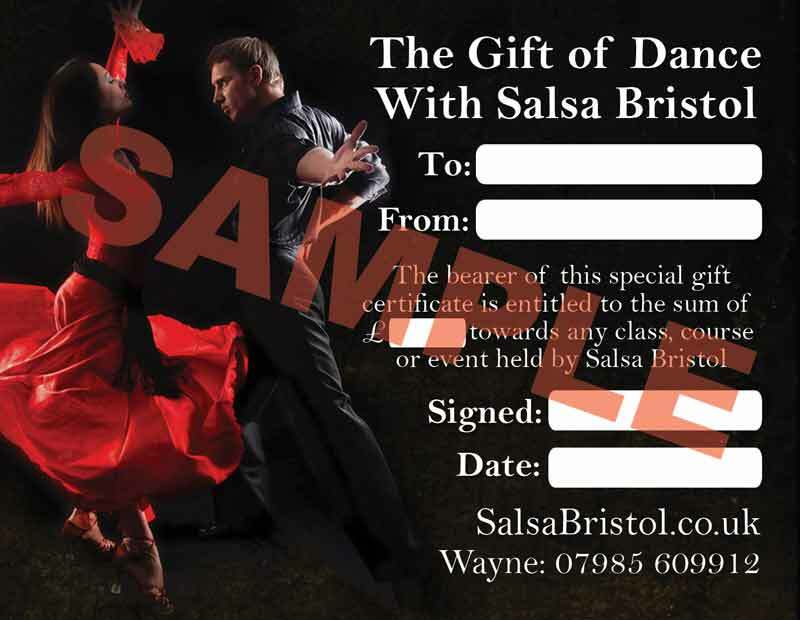 Then why not treat that special someone to dance lessons with Salsa Bristol! Contact us with your requirements and we will tailor the certificate to suit your needs - you can buy a certificate for one or more courses, a single person or a couple and so on. Get in touch here for more information and to buy your certificate!